If you want a distinctive look for your door knobs and hardware, you've come to the right place. Allow First Impressions to make that perfect first impression for you. We have a small collection of molding door hardware for you to peruse, but are more than happy to hear your ideas, and we will design for you exactly what you have in mind. We have been in business since 1999 and have a special design and architectural team that is more than happy to create custom door pulls and molding hardware for you. Should you need items in a commercial capacity, we design distinctive commercial door handles as well. 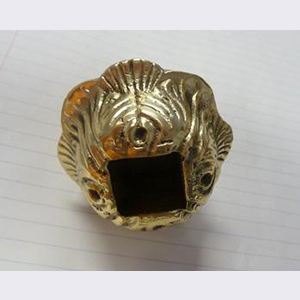 We have many different fabrications and finishes to choose from to make your door knobs shine. You have the ability to choose from gold and plated metals, crystal, clear and colored acrylics, and more to choose the look you want for your place of residence or business. 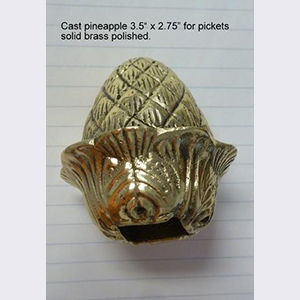 Cast pineapple 3.5" x 2.75" for pickets solid brass polished. We also offer an array of different finishes. Should your commercial door pulls be outside, we can add extra finish for extra usage or for weather resistance. Other finishes include antiquing and sheens. When it comes to decorative door hardware, we can make casts or molds of exactly the design you're looking for, such as a solid brass pineapple cast. Peruse our website for ideas and contact us through our web form, or give First Impressions a call at (954) 419-9918. If you opt for a standard product, it usually ships within one to two days of your order, allowing you to make your newest first impressions as soon as possible.